The name for this wine suggests a bonding process, a coming-together of two separate elements that combine to create a unified structural whole. The wine offers up notes of pepper, steak tartare, blackberry, cassis, white flowers and licorice. It is rich, medium to full-bodied, supple and juicy. Drink it over the next 5-7 years. This wine displays an opaque deep purple hue with a dark garnet edge in the glass. Swirling aromas of pine sap, cinnamon stick, pencil lead, and warm blueberry compote emanate from the glass in deep layers. The palate experience, while deep and intricate is also decidedly bright and energetic for a wine that comes from such challenging growing conditions. 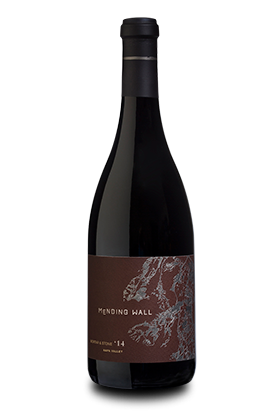 Bringing together mountain and valley floor fruit, round lushness and angular architectural definition, this wine displays how different parts of the Napa Valley can contribute complimentary components that form a complete wine of intrigue, power, and depth.